Disclaimer: Every effort has been made to anonymise all data published. All queries were run by a third party who provided descriptions of the various AM tables - I do not have access to the data set. I cannot run queries on the database-can't and won't tell you if your partner was a member. The Ashley Madison leak provided an interesting insight into the seedy underworld of a cheater. Unlike other dating sites, Ashley Madison's parent company Avid Life Media made no attempt to hide what this was - an outlet for otherwise married or committed individuals to have an affair. Without further ado I present the data. Irish Ashley Madison users were 89% male, 11% female. This data set shows the most common domain names (the @something.com part) of all Irish users email addresses. @defenceforces.ie, @the-sun.ie, @garda.ie, @gov.ie, @agriculture.gov.ie, @revenue.ie and many more besides. Note the data in this graph is logarithmic - emails in this chart @gmail.com are not directly comparable to emails @vodafone.ie, check the numeric legend at the top. Domain names with one or less users have been filtered in an attempt to protect anonymity. There were many small businesses or sole traders which fit into this category. Another data set of Irish domains is available here, also filtered, which queries the database for emails which end in .ie, regardless of country. 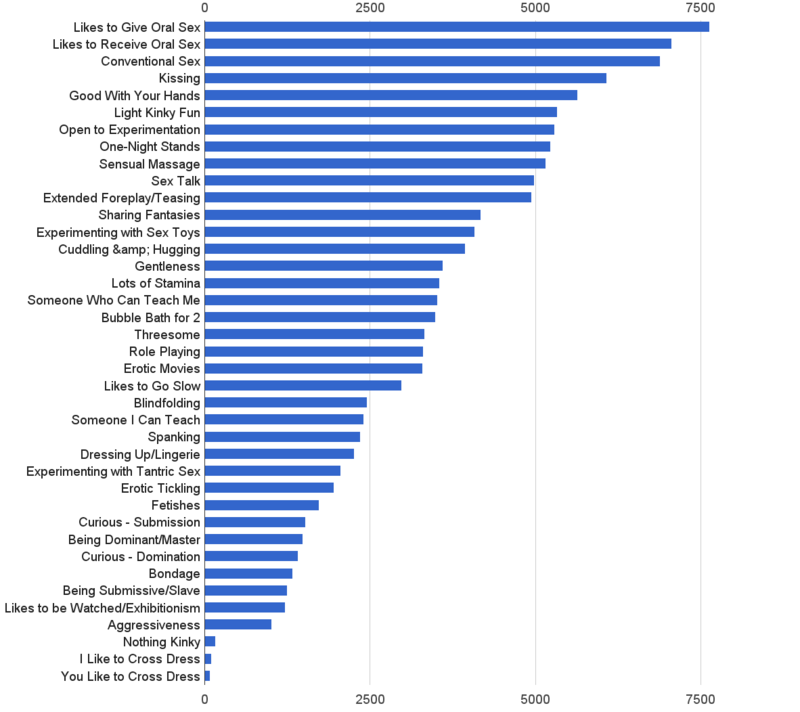 Reading into the above dataset, we can see what the most popular third level institutes are. I've assembled this list by hand, and may have missed some universities. Towns & Cities with the most Ashley Madison users in Ireland. Note the data in this graph is logarithmic - the number of users in Dublin is not directly comparable to users in Dundalk, check the numeric legend at the top. 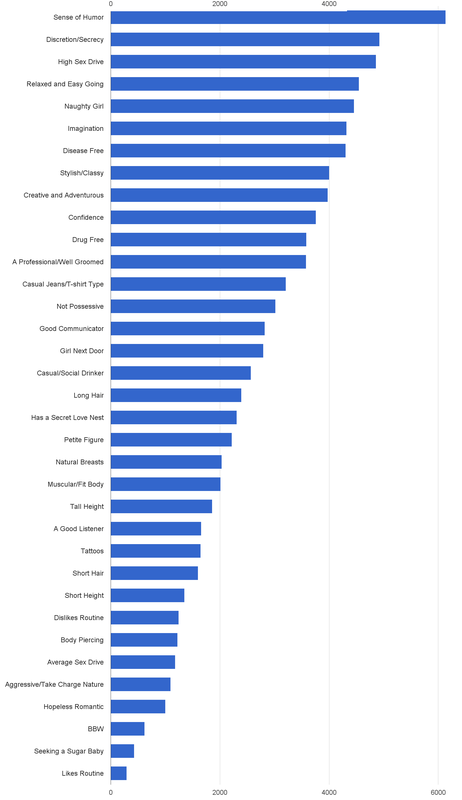 The "My Perfect Match" section of the site, this is what Irish users have stated turns them on in a partner, sorted by most popular. Unsurprisingly, Discretion/Secrecy is one of the most attractive traits to Irish Ashley Madison users. A total of 293 users also declare their love of routine as a turn on - I'm sure those folk must be a real riot. The "My Intimate Desires" section of the site, this is a list of entries users have indicated they are open to. How Irish users declared their ethnicity to Ashley Madison. How Irish users described their body type. Can't help but suspect people were being a bit generous? How people answered a question about their smoking habbits. You can view the full data set driving these graphs in Google Sheets. The queries which generated these data sets are also available on github.